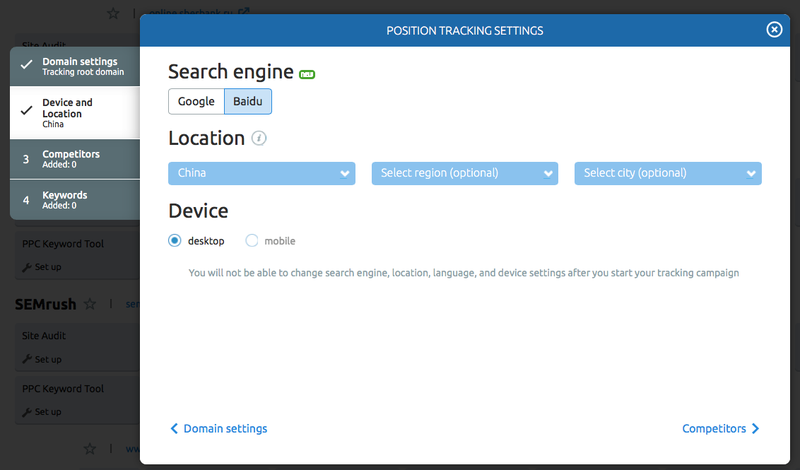 We are excited to inform you that we’ve launched rank tracking in the first Chinese search engine Baidu within our Position Tracking! This means that using this update, you can now track your website positions for certain keywords in Baidu along with Google search engine. This update will be especially useful if you’re promoting your business in China or working on your brand awareness on an international level. Now let’s get straight to the details. Go to Position Tracking and click on the ‘Set up’ button for your project. After you’ve entered your domain, just click on ‘Baidu’ in the ‘Device and Location’ window. Country (China) and device (Desktop) will be selected automatically. For now, no specific locations and other devices are available to track. Complete the next wizard steps — add your competitors and keywords — and click on ‘Start Tracking’. Go to Position Tracking and open your project. Click on the ‘Your Devices & Locations’ section on the top left and tap on the green ‘Add new device or location’ button. Next, click on ‘Baidu’ in the ‘Device and Location’ window. Country (China) and device (Desktop) will be selected automatically. For now, no specific locations and other devices are available to track. 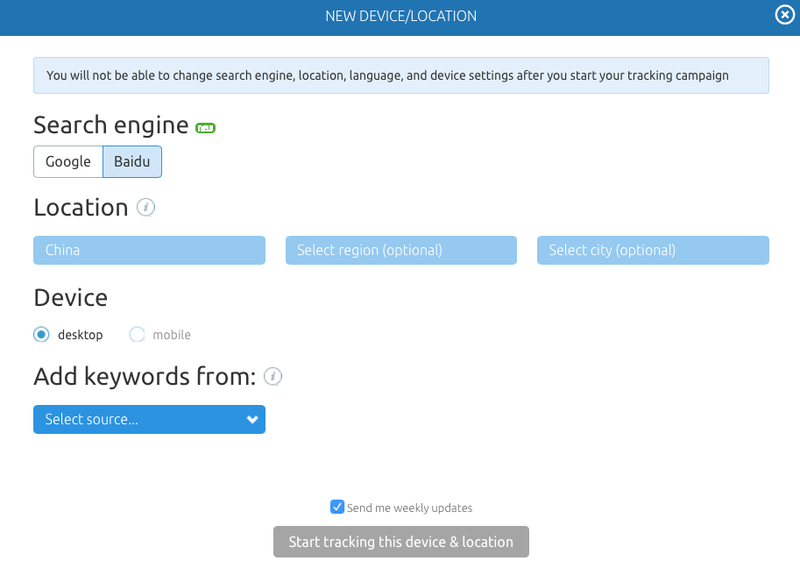 Add your keywords and click on ‘Start tracking this device & location’. 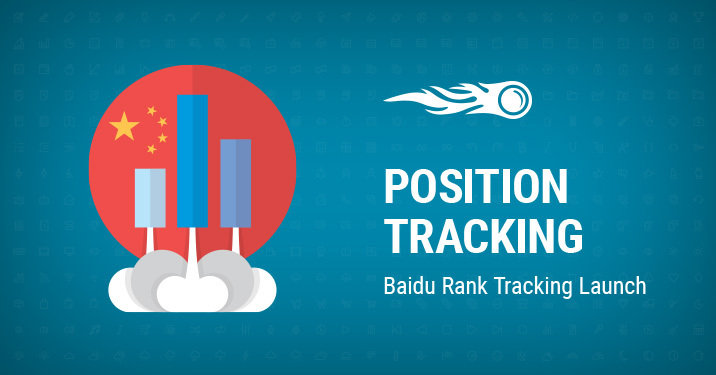 Now you can track the top 50 Baidu positions for 500 to 5000 certain keywords (with the possibility of buying more keywords) depending on your SEMrush plan and compare your performance in Baidu and Google search engine. Please note that search volume, CPC metrics and Baidu SERP features are not available at the moment. If you’re new to the tool, check out 11 features you have to try out in Position Tracking. What do you think about this update? Share your thoughts and ideas on how to improve the tool at [email protected].